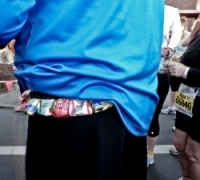 Race Fueling: How Many Calories Should I Eat? I’m often asked by clients how to nail down a fueling strategy for racing. One of the points I often make is to dial in your calories per hour, and I suggest a trial-and-error method in finding the right amount to eat during an event. Let’s go into a little more detail on figuring out how many calories you should consume during a race. We’ll only consider races of two hours or longer, as the intensity is lower in events of that duration and you will likely want to replace some of the calories you burn. I would like to lead off by reminding you that there is no ideal formula that works for everyone and there are a lot of variables (lean body mass, metabolic efficiency, intensity, race distance, and environmental conditions) that can affect your personal nutrition strategy. What I can do is provide a basic understanding of things to consider and a general methodology to try in order to figure out your personal fueling plan. One very useful piece of information in determining how many calories to consume during a race is knowing how many you burn during your activity. Heart rate monitors often have a feature to estimate this, as does TrainingPeaks. However, if you really want to nail it down specifically, get yourself tested on a metabolic cart. 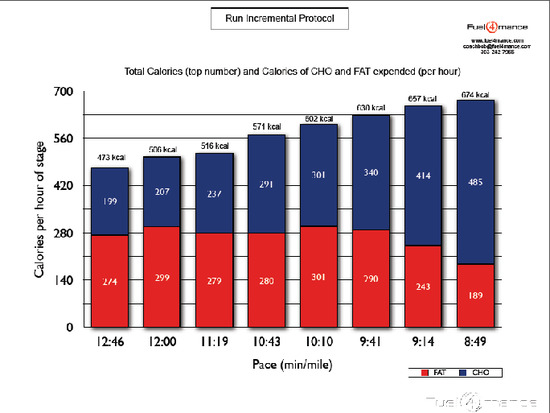 This information will also tell you how “efficient” you are at burning fat vs. carbohydrates at different intensities. Above is a test that I did with Bob Seebohar of Fuel4mance in January 2011. These calorie numbers were calculated from my O2/CO2 exchange rate, so they should be pretty accurate. Please note that this chart shows my unique test results – your ability to burn calories at various intensities will differ from mine due to the factors listed above. I will note that these approaches are not mutually exclusive. It is a good idea for all endurance athletes to improve metabolic efficiency. You can manipulate your metabolic efficiency by diet and doing some longer sessions at an easy pace with minimal calories. Your metabolic efficiency training should be in your prep and base phases when your training intensity is low. You can also “Train Your Gut” to tolerate more calories if you need them in order to stay on top of your game. So add training sessions to test what you can tolerate. Do you find that you have enough energy for your workouts and races? You should finish strong but spent, not crawling home or hitching a ride! Eat more often if you bonk! Do you ever get “grumpy” during a long session? If so, you likely aren’t consuming enough carbohydrates. Do you experiencing GI distress? You might be consuming too much or need to combine different sources of carbohydrate (i.e., glucose, fructose, sucrose, maltodextrin). You can try fewer calories or read labels to find products made with multiple carbohydrate sources and try different brands of products. You might also work on metabolic efficiency to see if you can reduce the number of calories you need. Do you seem to be able to eat whatever you want, even when the intensity is high? No reason to back off if it is working for you! If you make changes, start small (about 10-20% of current hourly intake in either direction depending on your circumstances) and keep track of how it worked for you. If you are really struggling to dial in your caloric intake, one of your best resources is a Registered Dietitian who is also a Board Certified Specialist in Sports Dietetics (CSSD). Despite the many variables involved in race fueling, if you know how many calories you are burning and what your specific “nutrition issues” are, you have a starting point for how many calories you will need and can then begin the tweaking process. Nicole Odell is a USA Cycling, USA Triathlon, and TrainingPeaks Level 2 Certified Coach. She runs the endurance sport coaching company NEO Endurance Sports & Fitness, LLC (http://neoendurancesports.com), and wants to make sure you have more fun and go faster when you swim, bike, and/or run. You can find Coach Nicole on Facebook, Twitter or contact her via email at nicole@neoendurancesports.com.